It seems there are significant differences between No Waiting, No Stopping and No Loading. 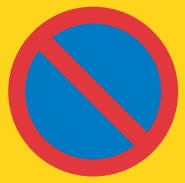 The strictest of these is ‘No Stopping’ also known as a ‘Clearway’. 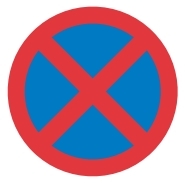 It is symbolised by a red X on a blue circle with a red outline. You cannot stop there whether it is to park, let passengers in or out, sit in your car (with your engine running or not) or to load or unload stuff. The painted line equivalent is a red line along the road. 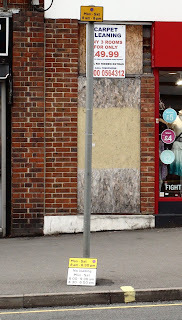 A single red line means No Stopping at certain times (shown on a sign nearby), a double red line means not at any time. We seem not to have any of these in Central Road. The more lenient version is the ‘No Waiting’ restriction. This is a single slanted red line on a blue circle with a red outline. This effectively means no parking or waiting. From what I understand, this one hinges on your car being ‘in use’ or not. So if you have stopped to pick up or drop people off it is okay to stop here. Also if your car (or van etc.) is in use – being loaded or unloaded with goods, then that is okay too. However, just sitting in it (with your engine running or not) is considered ‘waiting’ rather than ‘in-use’ and is a no-no. 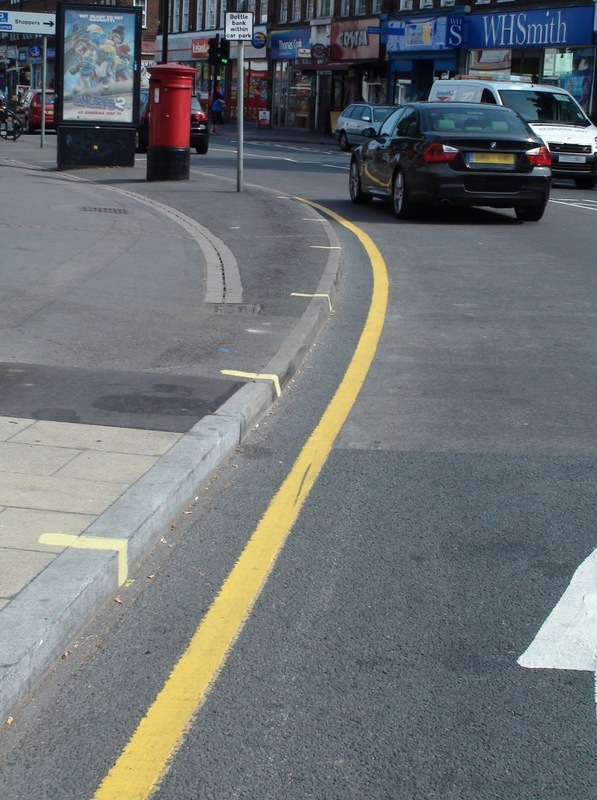 The painted line equivalent of ‘No Waiting’ is a yellow line along the road. 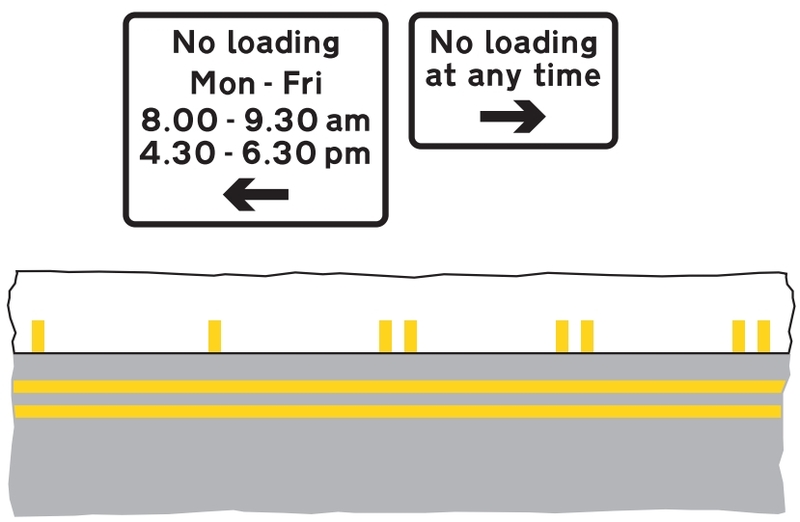 A single yellow line means no waiting at certain times (shown on a sign nearby), a double yellow line means at any time. ‘No Parking’ means you can wait in your car, you just can’t leave it there while you go and do other stuff. Please note that this is not a comprehensive description and that I am not any sort of expert on this. For proper guidance you should have a look at this direct.gov pdf document which unlike this blog, is obliged to be accurate. So that's the theory, what about the reality? Apart from the dedicated parking bays, the entire length of Central Road appears to have ‘No Waiting’ restrictions. 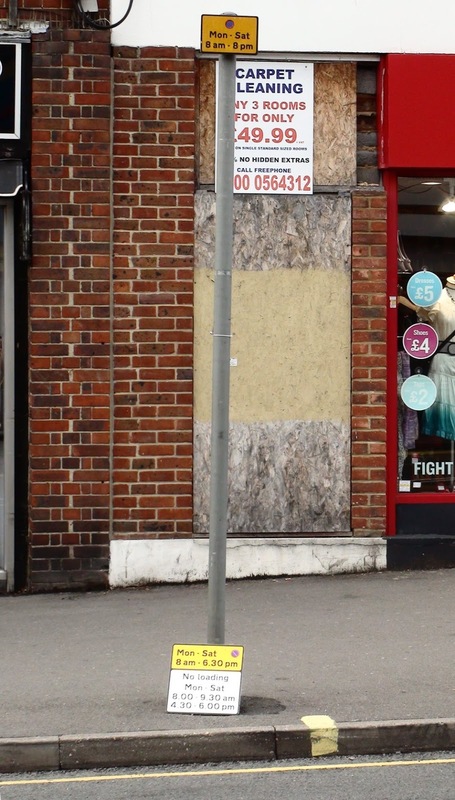 In fact you need to travel up Cheam Common Road past Ruskin Drive before you see a stretch of road that is not adorned with yellow lines however most of this was there before. The ‘No Waiting’ restrictions have been eased back by one and a half hours. Where they used to be from 8am until 8pm, they are now 8am unil 6:30pm. 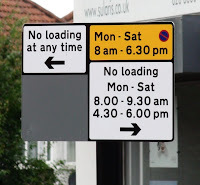 More ‘No Loading’ restrictions have been introduced along Central Road with no loading anywhere in Central Road during peak times. And ‘Loading Only’ bays have become parking bays from 12:30pm until 6:30pm. You can read all about the original proposals on page 5 of this council document. And you can read in even more detail about the works on this official Council works notice. Fines given out before parking signs displayed? According to this official notice, the new restrictions came into operation on the 1st of July. However I first noticed the new stripes painted on the road around three weeks later. (Isn’t it great that photos are dated!) The new parking signs hadn’t finished going up until a month later either. Unfortunately I have heard of at least one report of someone receiving a fine for loading before the ‘No Loading’ signs had all been put up. I wonder if the Council feels this is justified? The overall result seems to be a little more parking available and substantially less loading space available. 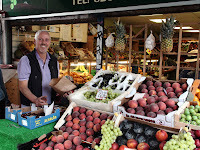 Having spoken to several local traders, the ones who receive their deliveries overnight or very early in the morning are not really affected by the changes and are glad to see a little more parking available. This seems the same for those ones who don’t rely on large deliveries or don't need to do any delivering of goods themselves. However I spoke to two traders who are affected quite badly by the new loading restrictions. 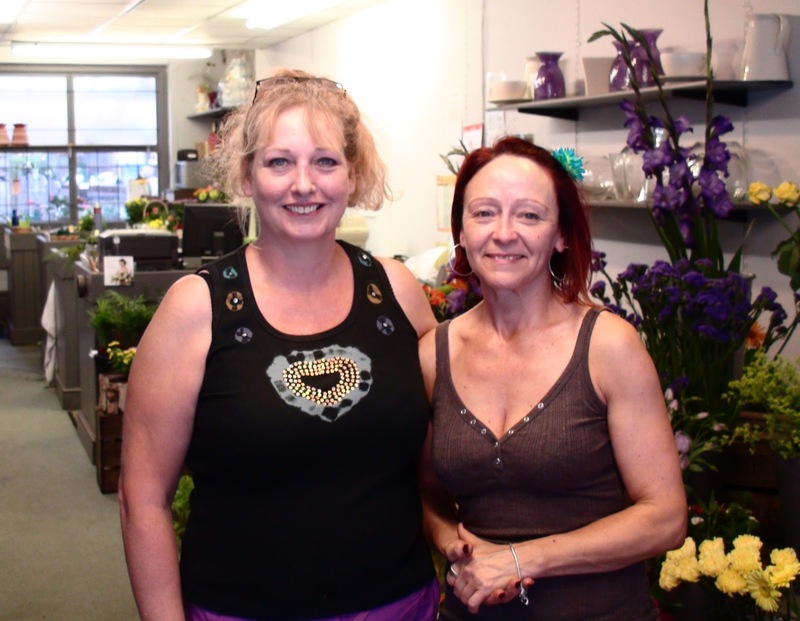 Both Ross from ‘Ross Fruiterers’ and Gaynor from ‘The Conservatory Florist’ are adversely affected by this because a large part of their business is delivering goods. 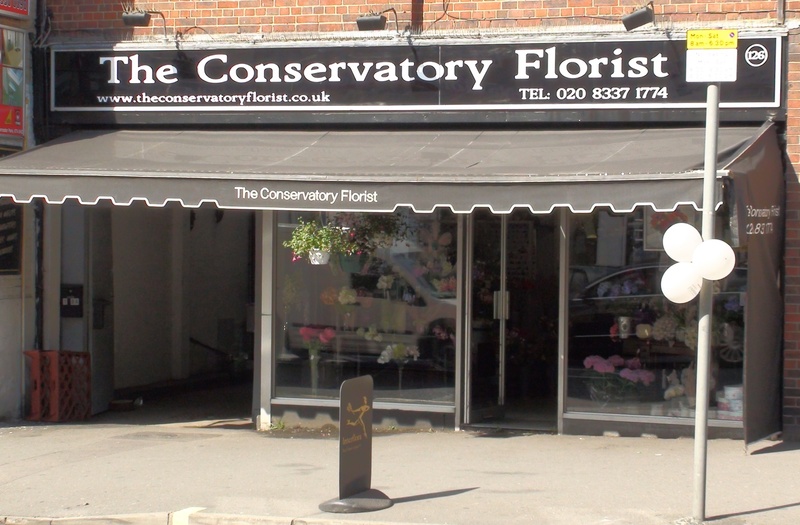 Gaynor who owns ‘The Conservatory Florist’ told the blog that they supply flowers for several funerals a week and need to time their deliveries around the funerals. During the new morning restrictions they have had to park at the other end of Caldbeck Avenue when the loading spaces in Longfellow were taken and "you just can’t carry a full coffin spray all that way". 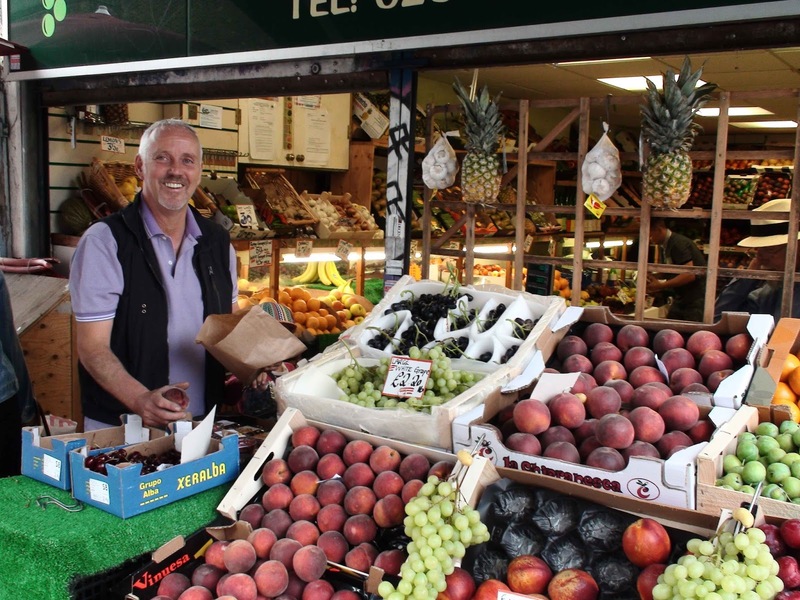 Ross Nelson who has run his fruit shop on Central Road for 23 years told the blog that he hasn’t got the space in his shop to pile up his afternoon orders. He needs to load them straight into his van but can’t do that if he can’t park close to the shop to load them. 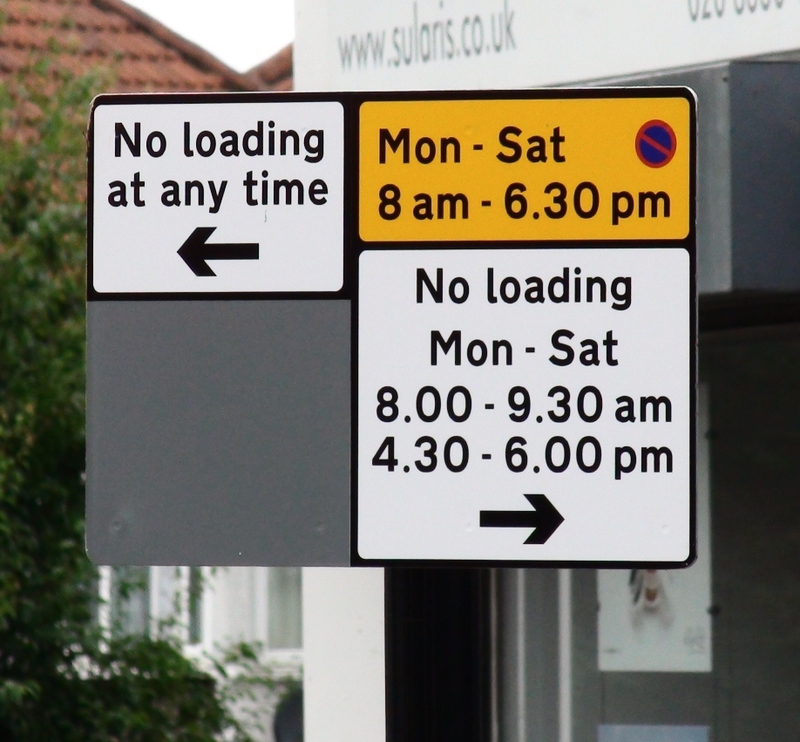 So dear reader, over to you - what are your thoughts on the new parking/loading restrictions in central Road?